When we decided to host our first ever cookie exchange at the yoga loft I was pretty excited….. Since I am working on cutting processed sugar out of my diet completly I was also questioning what I could make and offer to everyone that would be both delicious AND healthy. Then, at just the right moment I saw a recipe online from a wonderful nutrionalist, Dr. Kristen Bentson, who lives here in the Lehigh Valley. She has really helped me learn how to eat well and understand how food can work for me or against me. 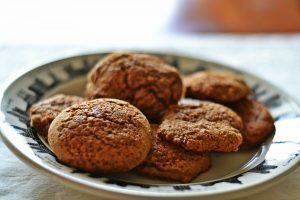 Her Pumpkin Spice Cookie recipe was recently featured in a Huffington Post article alongside other tasty looking recipes, all of which are shared below. I hope you will mark your calendar for Sunday, December 11 to attend the cookie exchange, which will begin at 3:00pm. Have a wonderful day!